Import your eBay product listings to your Facebook page in a snap. Products are automatically loaded from your eBay account any changes to your inventory is automatically synchronized to your Facebook store, such as new listings, sold listings, and modification. Features include pagination, multiple eBay Accounts support, store-wide search, categories filter, multiple sorting options, social buttons for each item, and much more. The store is designed with customers in mind. Content is quickly loaded without reloading whole page. We made sure the app works great on mobile devices. There is one additional step to make the store mobile friendly. Watch this video for details. 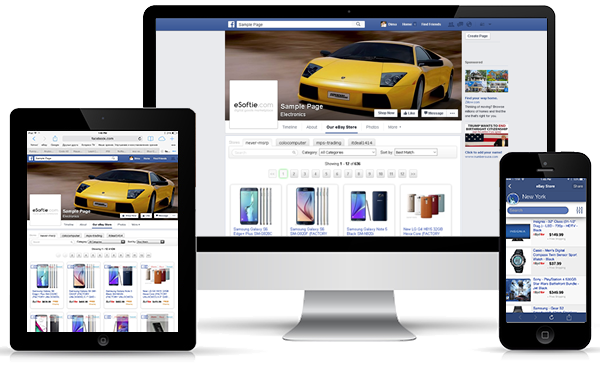 Show your eBay listings on your Facebook page to millions of Facebook users. The app is very easy to set up and use. Only your eBay User ID and your Country is needed to set up yoru styore. The app is not asking any personal information, passwords, and no special authentication is needed. Customers will be stunned with the way your store looks. Your visitors are able to find just what they are looking for using dynamic search feature. Multi-level catengies filter allows your customers to narrow down search results. 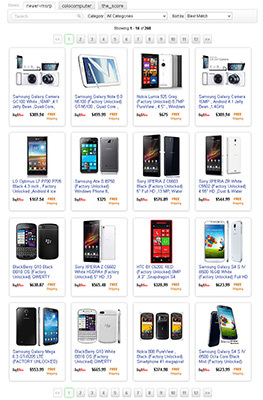 Just like on eBay website, your visitors can sort your products by price, best match, listing time, and ending time. Sell in one store from multiple eBay accounts at once. Optionaly products from all accounts can be combined in one list. Ability to insert any HTML code or plain text in the header of your store to customize it’s appearance or simply add a welcome message to your visitors. Each product can be simply posted to your page’s timeline with a share button. Each item has 4 social media buttons [Like], [Share], [Pin], [Tweet] to share your products to their friends, fans, and followers. Remove third party advertisement from the top and bottom of your shop to make it look even better. NOTE: This video demo gets outdated over time as Facebook is constantly changing.